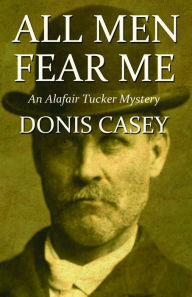 MY BOOK, THE MOVIE: Donis Casey's "All Men Fear Me"
Donis Casey is the author of eight Alafair Tucker Mysteries. While researching her own genealogy, she discovered so many ripping tales of settlers, soldiers, cowboys and Indians, murder, dastardly deeds, and general mayhem that she said to herself, “Donis, you have enough material here for ten books.” The award-winning series that resulted, featuring the sleuthing mother of ten children, is set in Oklahoma and Arizona during the booming 1910s. The latest installment, All Men Fear Me, is now available from Poisoned Pen Press. Read the first chapter of each Alafair Tucker Mystery on Casey's website. Casey is a former teacher, academic librarian, and entrepreneur. She was born and raised in Tulsa, Oklahoma, and now lives in Tempe, AZ, with her husband. Last year I dreamcast an adaptation of my seventh Alafair Tucker mystery, Hell with the Lid Blown Off. For that Oscar-winning movie, the part of my sleuth Alafair, a medium-sized, middle-aged woman with ten children, was played by Kathy Bates/Joan Allen/Sandra Bulloch/Meryl Streep, as suggested to me by readers of the series. I’m sure you can picture her now. Alafair’s husband Shaw, a tall, dark man with a floppy mustache was played by a forty-five year old Tom Selleck. Or in some minds’ eyes, he was Matthew McConaughey/George Clooney. In this year’s adaptation of the eighth Alafair novel, All Men Fear Me, which is set at the beginning of America’s involvement in World War I, Shaw and Alafair are back, as are all ten of their lively children, their sons-in-law, and their grandchildren. Their two sons, Gee Dub and Charlie, are ready to do their duty; twenty-year-old Gee Dub, because he has to, and Charlie because he is sixteen and too full of patriotic ardor for his own good. The problem with casting the boys is that I’m not up on today’s crop of young actors. I’m sure the perfect tall, lanky young man with a mop of dark curls is out there to tackle the role of Gee Dub, but I don’t know who he is. I like the head of hair on Graham Phillips, the young guy who plays Alicia’s son on The Good Wife. Could he be a laconic, Western type? As far as a choosing a great actor, I couldn’t go wrong with Freddie Highmore, even if he is English. I mean, he is a great actor, so surely he could handle an Oklahoma drawl. And he has grown up very well since he was Charlie in Charlie and Chocolate Factory. Speaking of Charlie, Alafair’s son Charlie is one of the engines that drives All Men Fear Me, so I hope that a big-for-his age, blond, sixteen-year old shows up for casting call. Remember the little kid in the movie Big Daddy? He was played by a set of twins, Cole and Dylan Sprouse, and when last I checked, the boys are now fair-haired six-footers. How is your horsemanship, boys? The other catalyst for this tale of fear and unrest is Alafair's brother, Rob Gunn, the union organizer and antiwar activist who drops by for a visit at the worst possible moment. Rob is a slight man of forty with a full beard and a reddish complexion. They’re not so slight nor are they so red, but both Matt Damon and Bradley Cooper have both the intensity and the rakish style that would serve the part well. Besides, if either man played the part, that would give me a great excuse to visit the set every day. As for old Nick, the mysterious stranger in the bowler, how about another Nick? Nick Nolte would look perfect in that hat. And as always, I’ll play the part of Grandma Sally myself. The Page 69 Test: Hell with the Lid Blown Off. My Book, The Movie: Hell With the Lid Blown Off. The Page 69 Test: All Men Fear Me.